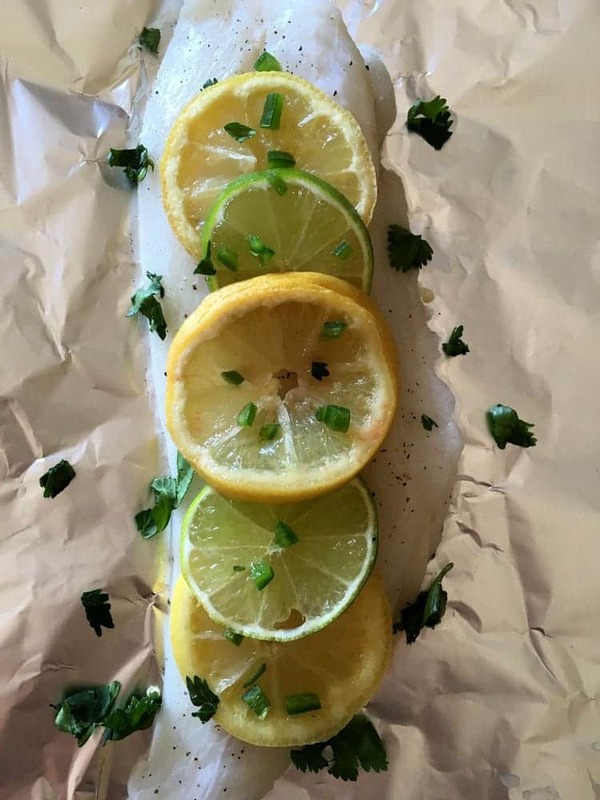 Citrusy Baked Orange Roughy is an easy and healthy dinner recipe that uses foil packets to steam the fish and produce wonderful results in only 15 minutes. 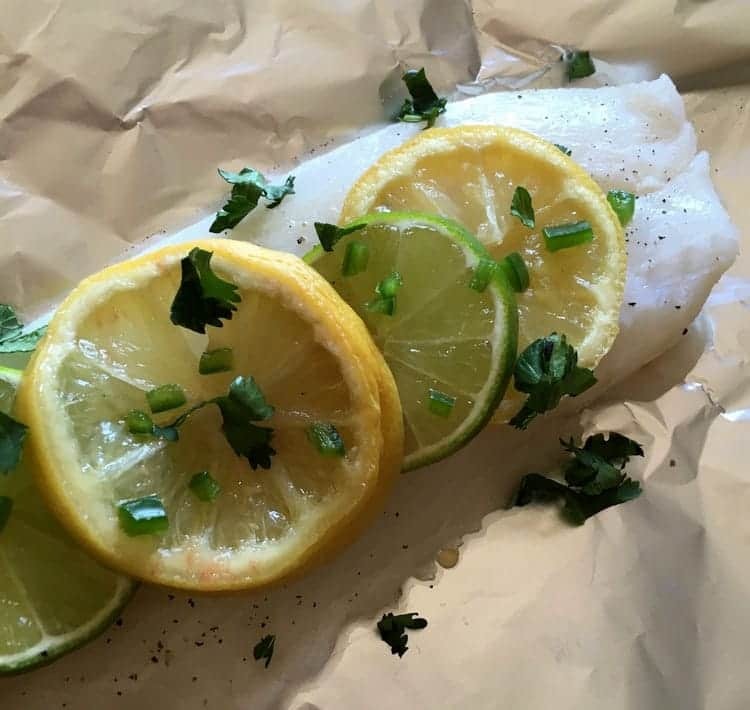 If you’re searching for grilled orange roughy recipes, you’ll be happy to know these foil packets can also be put on the grill! 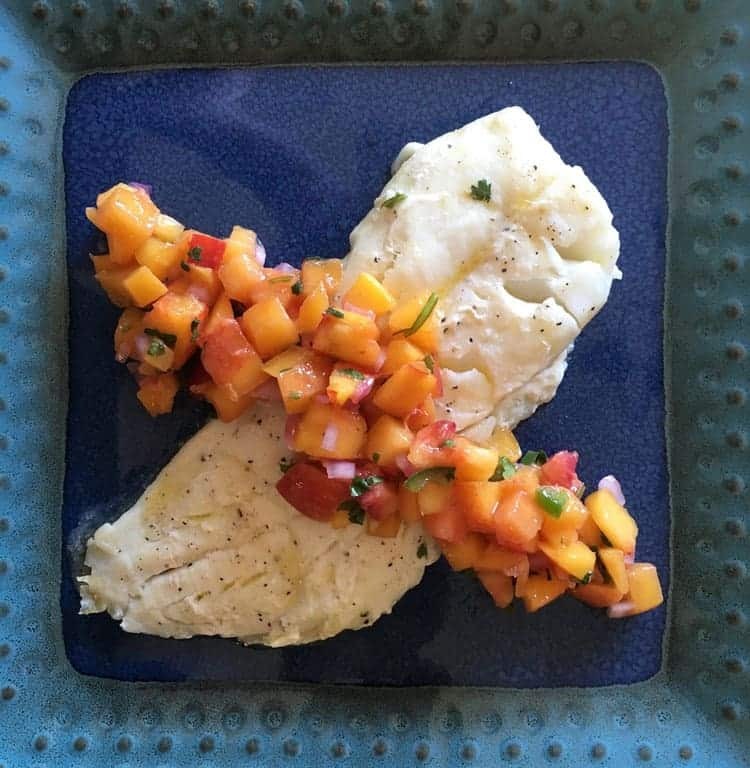 Instead of orange roughy, you can use any type of fish or lean protein. Instead of jalapeno peppers, cilantro, lemon, and lime, you can use any vegetables, herbs, or seasonings. Instead of baking the foil packets, you can grill them. The only thing you can’t change about this recipe is the foil packet cooking method because that’s the key to it all. It’s an ingenious cooking method that you’re going to fall head over heels for if you’ve never tried it before! To be honest, I pretty much wing it when I use the foil packet method. I just use whatever ingredients I have on hand, don’t measure a thing, and I can happily report that I have never been disappointed with the results. When it’s cold outside, I bake the packets in the oven. During the summer, I throw them on the grill with whatever meat we’re eating and enjoy a glass of wine while sitting outside and waiting for them to finish cooking. I have a lot of good food memories with this cooking method —I’m definitely a huge fan! Now that I’ve sold you on the cooking method, let’s talk about the recipe. Orange roughy is an excellent fish. Orange roughy has a great mild flavor (not overly “fishy”), and it’s a firm fish, meaning it holds up well during cooking. You can use fresh or preserved lemons in this recipe. Fresh is a convenient option, but I think preserved lemons make the recipe so much more flavorful because of the concentrated lemon flavor. You can make your own preserved lemons (it’s easy to do using Himalayan salt blocks), or you can order preserved lemons here. The only caveat about using preserved lemons is the fish can be overly salty if you salt it in addition to the salt in preserved lemons. Taste the fish before adding additional salt! You can start with frozen orange roughy fillets. Just add a few minutes to your cooking time. It pairs well with a green vegetable or rice side. Citrus Orange Baked Roughy is excellent with steamed broccoli (which you can also steam in a foil packet) or white rice. This versatile recipe can be easily converted to a grill recipe. Instead of baking the foil packets in the oven for 15 minutes, place the packets on the grill over direct medium heat for approximately 8-10 minutes. Enjoy this recipe baked in the oven when it’s cold outside or grilled on the grill when it’s warm outside! My family loves both cooking methods and I think yours will too. Interested in orange roughy nutrition facts? You’ll be happy to know that orange roughy is a nutritious fish that is packed with protein and low in calories and fat. Because it’s lower in fat, it won’t have as many beneficial omega-3 fatty acids as a fish like tilapia or salmon, but it’s still a good source. Orange roughy is also high in the mineral selenium. I hope you enjoy Citrusy Baked Orange Roughy, and I hope you enjoy this easy and versatile cooking method! Citrusy Baked Orange Roughy is a simple and highly versatile dinner recipe. Preheat oven to 400 degrees. Tear off 4 sheets of aluminum foil that are large enough to fold over an orange roughy filet and have a few inches to spare on each side to seal the packet. On each sheet, place a filet slightly off center and add 3 lemon slices and 2 lime slices on top. Top each filet with a quarter of the cilantro and jalapeno pepper, and then top with 1 T. butter. Sprinkle salt and pepper on top to taste. Seal the packet by folding the aluminum foil in half over the ingredients. Fold the three open sides one at a time and over several times to seal the foil packet completely. The packets should be tight enough to hold in steam, but still loose enough to allow room for the air to expand. Into the preheated oven, place the packets and cook for 15 minutes. (If using filets that are still frozen, add a couple minutes to your cooking time.) After cooking, open the foil packets carefully to avoid the hot steam. Discard lime and lemon slices. You can either transfer the filets to plates or leave them inside of the foil packets. Top with a flavorful salsa, such as spicy peach salsa, and serve. Place the foil packets on a hot grill over medium direct heat and cook for approximately 8-10 minutes.